The Fairey Long-range Monoplanes were a pair of British experimental aircraft of the late-1920s and early 1930s. They were single-engine, high-wing aircraft with fixed tail skid landing gear. The first aircraft was designed to meet Air Ministry Specification 33/27; it was issued by the Directorate of Technical Development (DTD) in December 1927 after the failure of three attempts by the RAF to break the absolute distance world record flying Hawker Horsley bombers. According to a Ministry spokesman in the House of Commons, this aircraft was to be constructed not just "for a specific record," but as a serious study into methods of increasing the range of aircraft. In order to soothe the anxieties of the Treasury, the aircraft started life as the Postal Aircraft. The sharp, pointed nose and sleek lines of the prototype gave rise to the nickname "Eversharp," after the maker of pens and mechanical pencils. Although other configurations were studied, after wind tunnel testing, a high wing was chosen, allowing a gravity feed from the fuel tanks. The wing spars were of wood and the wing used a pyramid system of internal bracing with fabric covering. The fuel capacity was 1,043 Imp gals (4,742 L) and the system used a gravity feed and mechanical fuel pump in sequence; a wind-driven, emergency back-up pump was also provided. There were other features dedicated to the long-range function; there were two parallel oil filter circuits, allowing one filter to be removed and cleaned while the other remained in operation. The aircraft was even equipped with a pneumatic bed for a reserve pilot. After extensive testing using a Fairey IIIF and a DH.9A, the Napier Lion XIA of 570 hp (430 kW) was selected, late in the gestation of the machine. The first built, J9479, flew for the first time on 14 November 1928 from RAF Northolt. The aircraft was handed over to the RAF on 7 December, and with testing continuing in preparation for the record attempt, including a 24-hour trial on 22-23 March 1929. It was decided to attempt a flight to Bangalore in India, a Great-circle distance of about 5,000 mile (8,000 km), comforably in excess of the existing record of 4,466 mile (7,188 km) set by a Savoia-Marchetti S.64 in July 1928. Squadron Leader A G Jones-Williams and Flight Lieutenant N H Jenkins set off on the record attempt from RAF Cranwell, Lincolnshire on 24 April 1929. The aircraft was slowed by headwinds, however, and the plane landed at Karachi after 50 hours 48 minutes in the air. Although the flight was the first non-stop flight between Britain and India, the great circle distance of 4,130 miles (6,646 km was short of the world records. It was decided to make another record attempt later that year, although the record had been raised to 4,912 miles (8,007 km) by the Breguet 19 Point d'Interrogation. This time it was planned to fly to from England to South Africa. This second attempt, with the same crew as the first, took off on 16 December 1929, but crashed south of Tunis, destroying the aircraft and killing the crew. Despite this setback, the Air Ministry ordered a second Long-range Monoplane (K1991) in July 1930, this flying on 30 June 1931. While similar to the first aircraft, it had a number of differences, including the addition of an autopilot. From 6-8 February 1933, Squadron Leader O Gayford (officer in charge of the RAF Long Range Development Unit) and his navigator Flight Lieutenant G.E. Nicholetts flew non-stop in the second aircraft K1991 from Cranwell to Walvis Bay, South West Africa. This was a world long-distance record of 5,410 mi (8,540 km). 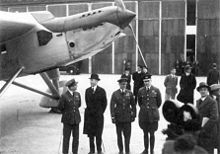 On their return to RAE Farnborough, they were met by the Air Minister (Lord Londonderry), Under Secretary for Air (Sir Philip Sassoon) and Sir John Salmond, Marshal of the Royal Air Force. Gayford and the LRDU would later make long distance flights with the Vickers Wellesley. Cooksley, Peter. "Long Range Fairey". Air Enthusiast, Fifty-one, August to October 1993.Stamford, UK:Key Publishing. ISSN 0143-5450. pp. 49-53. Taylor, H. A. "Record-breaker Extraordinary." Air International, Volume 13, No. 1, July 1977, pp. 18-24. Thetford, Owen. Aircraft of the Royal Air Force 1918-57. London:Putnam, 1957.